I’m a huge fan of NATURALS at Christmas. And I love this beautiful bleached pinecones diy! Have you ever bleached a pinecone? They are easy to make and the results are quite stunning! Everyone should do this science-experiment-diy… it is amazing and fun! And you don’t have to be crafty! Really! 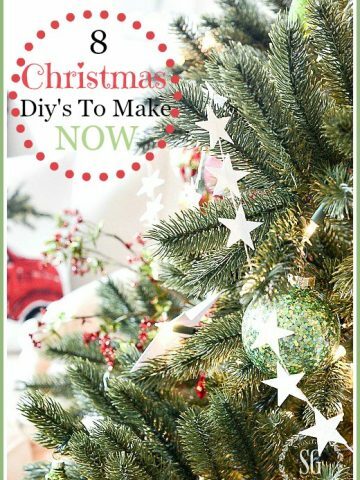 Let’s make bleached pinecones! Bleaching pinecones is a very easy process, but make sure you set aside several days to bleach them. When they are completely dry they open up and turn from dark, deep brown to a soft taupe and blonde. Make them now for your holiday decorating! 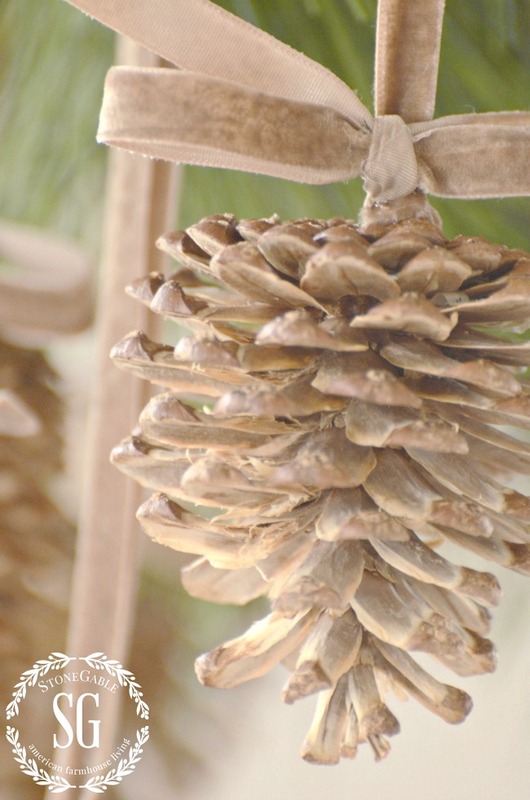 I hung bleached pinecones on a thin light taupe ribbon for a monochromatic look. Aren’t they unusual and beautiful? I’ll be making bunches this year for Christmas decorating! * If you can’t wait for the pinecones to dry… let them air dry for one day and then you can dry them in a 250 degree oven until they open up and are dry. 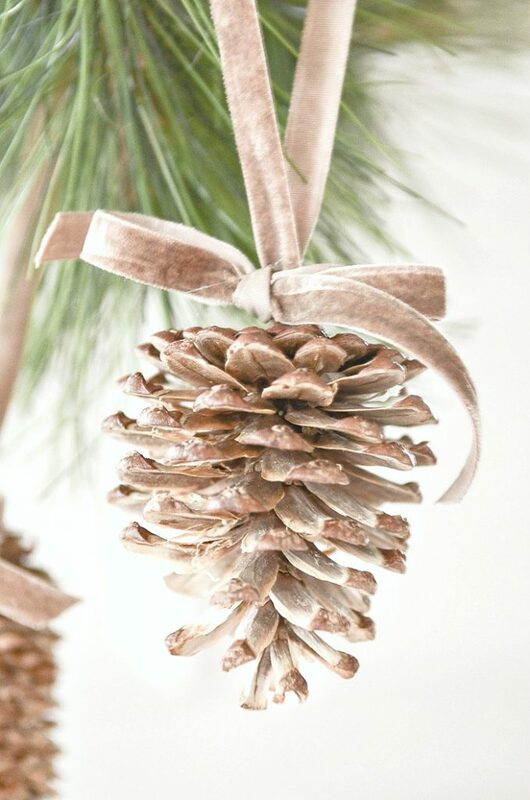 When the pinecones are totally dry add a ribbon hanger and bow. 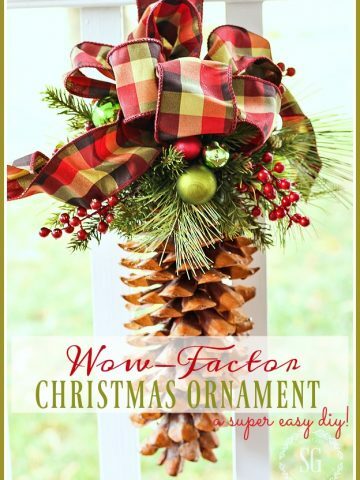 Cut a length of ribbon and put a dot of hot glue on the bottom of the pinecone in the center. Find the middle of the length of ribbon and adhere it to the pinecone. Let the ribbon dry and tie a bow around the ribbon close to the bottom of the pinecone, as shown. SO BEAUTIFUL!!! And very very easy!!! I hope you give bleach pinecones a try! This is perfect! We have a painted white stick tree, these will look beautiful on.! I am a big fan of naturals, I love to use pine cones and fresh branches from the various trees we have. I am very excited now to get started and bring in the Christmas season! I really enjoyed this Craft Post. I went one step further, I lightly brushed on a tiny bit of a tacky glue & as it dried I lightly pinched on the fine glitters. I also used matching silver, gold, rose gold, etc ribbons with the glittered pine cone. This gave them abit of sparkle. Thank you. They are gorgeous. I love them. Thanks for sharing. Hi! Thank you for this post. Brilliant idea! I have a silly question- Where do you buy pine cones? Thanks! Beautiful! These remind me of our first married Christmas when we were poor students and had a Charlie Brown type tree. We made velvet ribbon bows attached to pine cones for ornaments. One question, did you rinse with water the pinecones when you removed them from the bleach? Beautiful! How wide is the ribbon and is it tan? Also, where can I purchase? Thanks! Hi Kim, the ribbon is about 1/4 inch wide and I found it at a local shop. You might want to check on Amazon. I love the idea of bleached pinecones! Thanks for sharing that. Yvonne, I wanted to wish you a Very Merry Christmas. With all your prep and ideas I hope and pray you find as much enjoyment in the process as we find in what you share. 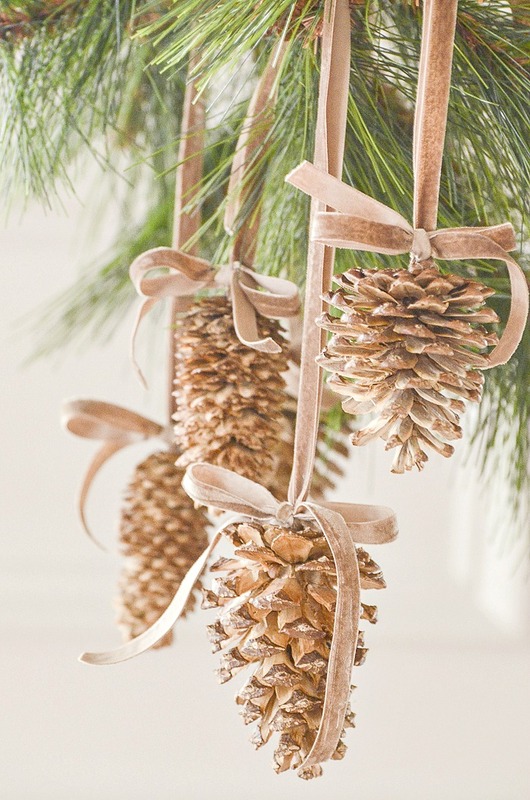 I love, love pine cones in Fall and Christmas decor. 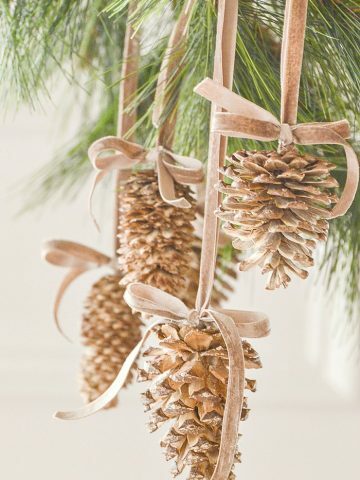 Love the look of the hanging pine cones on the taupe ribbon. So Pretty. Thanks again. Now I’ve added one more “Must Do” project! I have a whole huge bag of pine cones and now I know exactly what to do with some of them. Can’t wait to see the result! Thank you for such wonderful, ongoing ideas to help us beautify our homes. 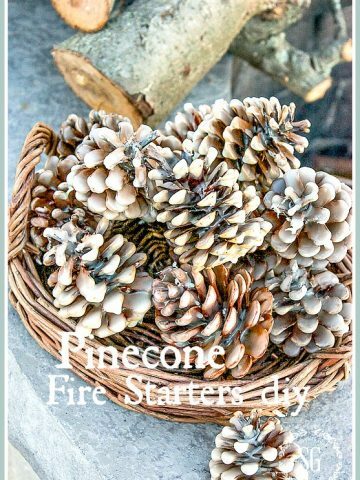 I loved the bleached pine cones, and got some great ideas from visiting the other blogs. Thanks!! lovely bleached pinecones! thank you for such fun ideas! Love the bleached pine cones! Going to start a batch today! 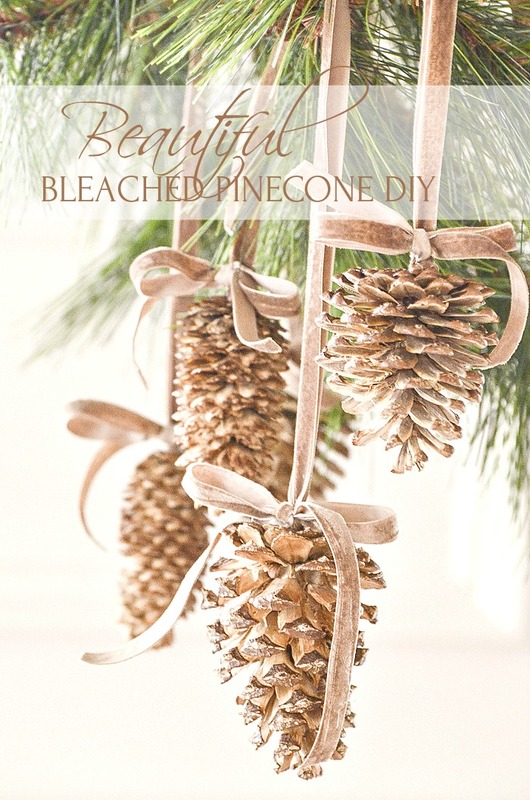 Bleached Pine Cones….simply beautiful and I want to try making these myself. Lovely idea! I may have to try this this year! I have not been making any money this year, but I have ribbon from last year’s and I’m sure I can add Bleach to the list withou too much argument from my non-creative husband. If I must be in this rental yet another Christmas, I guess I’ll have to make the best of it. Regarding the ribbon — how did you finish off the hanging end of the ribbon? Tied or connected to an ornament hanger? Thanks. Hi Janet, I hot glued it! I went pine cone picking over the weekend and now they are soaking in the bleach solutions. Now I just need to go ribbon shopping! Excited to see them on my tree! I just stumbled upon your blog on Facebook and I’m so glad I did! Great tutorial..thank you! Welcome to the StoneGable family, Lisa! So glad you found us! This is fantastic! I will look for pinecones they are all over the woods in my backyard. This pinecone idea will be done now but saved for next year. How fun! I can’t wait. I used 1 to 2 part measure, then 1 to 3, then pure bleach, nothing worked. Had the cones sitting in bleach for up to 3 days, Dried and still brown. Can anyone tell me how to get better results? Hi Joan, I have no idea. I know pinecones look brown until they dry and then they are a blondish color. Sorry, maybe try another type of pinecones. Also, if you got them at a store they may be dipped in something like a scent and that could inhibit the bleach from working. Love it! Thanks for sharing! Your home is beautiful! I am new to your blog (Fantastic)! I found you on Pinterest. I am like the other girls, I can not wait to see what you come up with each day! I have found a wooden candlestick with white washing finish. Some how I would like to use the bleached pinecones with the candlestick. Love your ideas and the fact that you are willing to share ideas. Gorgeous. I am doing this for the first time and I am very content with the result. I hope you don’t mind me using one of your pictures. I have put the link to your blog. I bleached sweet gum balls too they came out great! THANKS for the excellent idea. OH WOW! I’ll have to try this! I loved doing these pine cones because most of my lanterns are white but want the ribbon make it look just great. . With the things I am doing this year I love. I’ll tell you what I’m going to do when I get there I’ll keep in touch. I used a natural burlap ribbon. I hope you will send me a picture of your tree. I would love to see it! I can’t wait to try these! Do I need to “bake the bug out” first before I bleach the pinecones? Do these have a heavy bleach smell when dried? They are gorgeous. Would like to try this but have sensitive lungs when it comes to bleach smell. They have a heavy bleach smell when they are being bleached but not after. I used 2 Cups of Clorox bleach (the kind I purchase for my wash) to 1 Cup of water – within a few hours my pinecone just fell apart – What am I doing wrong? Not sure. Try using less clorox. Wondering if anyone experienced hot gluing the ribbon to the cone? My daughter and I bleached & dried them and now want to add ribbon but it isn’t staying… any suggestions PLEASE and THANKS! I used hot glue and it was fine. Maybe let let them dry out a good long time and then try to hot glue a ribbon. I have bags and bags of pinecones, I tried several different kind, soaked them for days and none of them turned white, is there a certain kind that you have to use……………. Elaine, let them totally dry and they will get “blonde”.They don’t turn white. If they have any kind of oil or wax on the outside, such as scented pinecones they won’t work. Hope this helps. How do you get rid off that awful bleach smell? any tips? The smell dissipates in a few days. Rinse the pinecones after they come out of the bleach water, that will certainly help.. they are wet and bleached already so rinse and let dry! I couldn’t get the pine cones to bleach. Could it have been because they were so tight ? I’ll try larger loser next time. Dorothy, as they dry they will open up and get lighter and lighter. Just be patient and let them dry! Thank you for sharing your beautiful crafts with all of us. I will send you a picture with the finished product. Great tutorial for bleaching the pinecones. I’m realy going to give it a try. Yvonne, I bleached my pinecones last week, just received my beautiful taupe velvet ribbon in the mail yesterday, and have my glue gun ready to go! We live in the woods and I have never had a woodlands tree, so this year is burlap and grapevine garland and the only ornaments will be pinecones! Husband is questioning my sanity, but he does that every year! lol Thank you for sharing your genius with us! Happy Thanksgiving! Your tree sounds wonderful. It pleases me that you are finding easy ideas from StoneGable to use in your home! Happy Thanksgiving! You are so very creative..how do you think of such creative ideas? What happens if I use pine cones that are scented with cinnamon? I’m not sure, Carol. Give it a try and let me know! I Love These! They are just beautiful, Yvonne. Could you just use all bleach for a whiter result?? Will leaving the cones in the fluid create a whiter result?? Just wondering if you’ve experimented with different methods. Thank you for all you do. I think straight bleach might be too hard on the pinecones. Give it a try, the only thing you might lose are a few pinecones! That is fantastic Yvonne!! I will have to try it! Yes. please do! They are beautiful! 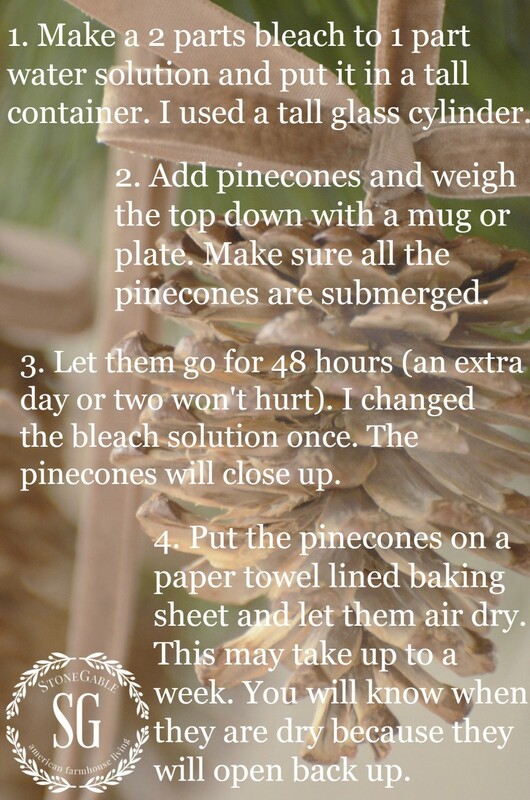 I want to try your bleached pine cone idea. Yours is so pretty with the ribbon! Thanks for hosting the link party also. I have been enjoying everyone’s ideas. Your posts are always so informative. Very great and easy idea.. I love it! I will give it a try! Thanks for inspiring. I have a basket of pinecones just waiting for my creativity. I will bleach them and hope they come out as lovely as yours. Thanks for sharing! Yvonne, I was just mentioning to a friend that she needed these for her Christmas decor this year. Your tutorial is fantastic…. I’ll be sharing it with her. (And pinning, of course!) As always, everything you do is exquisite. I have to tell you something that isn’t related to this post. It’s about your Raw Apple Cake. I have made it several times and each time the complements are overwhelming. Last night I took a fresh, out of the oven loaf to a dinner date with some friends. They were blown away! I served it with fresh whipped cream. Thank you for sharing this easy but so yummy dessert. These are really pretty and different. No more spray painting pinecones for me! Thank you. Thanks for the pinecone bleaching tutorial . I have lots of pinecones and can’t wait to try this. I’ve been wanting to do this – I have tons of pinecones and just added a huge bag from the thrift shop to my stash! Love the soft look of these! These are so beautiful! I love the beautiful and rustic feel! Thanks for the tutorial! I will be make these! These are just beautiful, Yvonne. I lean toward white when decorating, too, so I can’t wait to try this. Your home and decorating is such an inspiration to me. So elegant, yet comfortable. I’m very glad I found you! Fantastic idea. They looks so good. I love neutral. These are so elegant. And thank you for the DIY early enough I may be able to accomplish some for myself and my sisters. First, just use regular old pinecones that are open. When they are in the water they will close up. I <3 these! They are absolutely stunning and I will definitely be making some for my home! Thanks for such an awesome idea. I really like this craft! What kind of ribbon did you use? I have a basket full of pine cones and I can always go to the woods and get more! I love to use pine cones, especially at Christmas. But I have never bleached them. This I am going to do! Thanks for sharing, Yvonne! Really pretty, the monochromatic natural thing. I tried this with one pinecone recently just to see if it would work. I didn’t know to put 2/1 bleach to water though. I think I’ll try this again, but with more pinecones. Just love this, esp with the taupe ribbon. I couldn’t get the PINS to pin on pinterest…are they linked correctly? Sure do want to try this. My Christmas theme this year is “Naturally Beautiful”…this would be a perfect addition! Oh I was so anxious to see how these pinecones will turn out and they are exquisite, beautiful!…I see a project coming soon!…Great job Yvonne…and love the ribbon that you chose to hang the pinecone…perfection!!! Have a great weekend! Love the bleached pine cones!!! I’m going to Pinehurst, NC to play golf the day after Thanksgiving. There will be huge pineccones lying everywhere so I plan to gather some : ). Question: I used to be able to pin things from your blog while I’m on my IPad, but I can’t find a Pin It button on your blog page anymore. Can you add it back? Thanks! This will be my weekend project Yvonne. Thanks for sharing with us. I think the monochromatic look is so sophisticated. A few twinkling lights and you have a beautiful look. Thank you for the idea!! The pictures are great. Love this idea, Yvonne. I will be hunting for pinecones in my woods this weekend! Thanks! For Christmas. I love the idea of bleaching them for a natural woodland look. I love Anita at Cedar hill,glad you mentioned her she has a wonderful blog. Yvonne I love the look of the bleached pinecones; they are beautiful and unique for part of the holiday decor!different! Thank you for sharing this wonderful idea! “Crazy me” is now thinking . . . . after they are bleached, I wonder if they could be dyed with Rit or food color. Hmmmm . . .
After bleaching my pine cones I dyed some red and some green with Rit Dye. It worked well. I left them in the dye for a couple of days. I am very happy with the results. The ones that are bleached are my favorite but the bleached and dyed ones are good for adding a christmas feel. I know! I was thinking about adding something gold and glittery just to the edges. The pinecones are BEAUTIFUL and so elegant looking!! Your home is GORGEOUS!! I’ll have to be making some of these too!! Love the Pine Cones will try them next week. I cannot wait to get up at six in the morning and see what is waiting for me. You have something fresh and fun everyday. Back in the day., I worked with many people making homes be beautiful. I miss it , but this is so much fun seeing what you come up with each day. Our taste is very much the same. In fact, bought some square white plates yesterday. One can never have enough white plates. So I just wanted to say how thankyou I am for you and your blog friends. It seems we have all had some ruff times this year. I think it will be better for all next year. Please to wirite your blog, it means so much. I recently came upon how to bleach pinecones in a magazine. They were about the color of a Manilla folder and very pretty. The instructions were to place them in a two parts bleach to one art water and let soak for two days. I’m on day four, while their tips are ivory but for the most part they are mostly brown. I followed the instruction ratio as directed. Now I wonder, after seeing your more “normal” looking bleached pinecone, if those shown in the article I had gone by could have been spray painted the rich creamy ivory they were. Do you think my pinecones could be salvaged and please tell me your bleaching process, for some reason I’m only reading audience comments and haven’t come across your DIY instructions. Merry Christmas and thank you for helping me. Hi Jennifer, my directions are the same. The pinecones does not really change colors until taken out of the bleach and totally dried. They are a beautiful dark blonde color. I’ve bleached many pinecones and non every come out the color of a Manilla folder. Make sure you pinecones don’t have any fixative or scent sprayed on them. This might effect the color. Hope this helps. Hi Barbara, the bleached pinecones look pretty bad until they are totally dried. Or if they are broken and shredded, then you will need to find thicker pinecones. Hope this helps. Thanks… I’m still working on them. I’m a bit determined. Some of them are looking a bit better now. Thanks much.